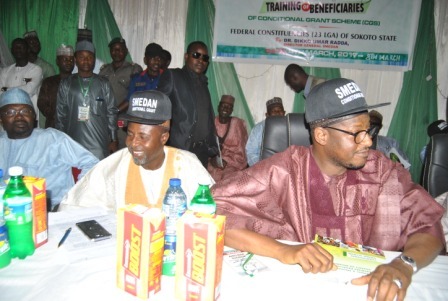 The Director General, Small and Medium Enterprises Development Agency of Nigeria (SMEDAN), Dr Dikko Umaru Radda, at the launching of the Conditional Grant Scheme ( CGS) Initiative of the Agency in Bauchi said that Micro Small and Medium Enterprises (MSME) represented 96 per cent of business activities in the county. Making reference to a survey conducted by SMEDAN in 2013, he said 37 million MSME engaged 59.7 million persons, which is 84.2 per cent of labour force, contributing to 7.27 per cent of the nation’s Gross Domestic Product (GDP).According to him, 90 per cent of the micro enterprises are informal and populated by people at the bottom of the pyramid, hence the introduction of Conditional Grant Scheme (CGS) for micro enterprises in Nigeria. He said that the process would enable informal enterprises metamorphosed into formal sector, industrialize the nation, develop the rural economy, stem youth restiveness and unemployment as well as create sustainable economy growth and development.Dr. Radda said that the present move would target capacity building and post-intervention support services such as access to finance, markets, workspace and technology, among others. He recalled that the scheme was first introduced in 2017 in 145 Local Government Areas of Katsina, Gombe, Ebonyi, Oyo, Akwa Ibom and Benue States. According to him, 13,000 enterprises in the those areas benefited from entrepreneurship training, formalization of registration of businesses, provision of insurance and access to finance through the provision of the grant of N50,000.Radda said that the SMEDAN had decided to extend the scheme to Lagos, Bauchi and Sokoto States, targeting 6,000 beneficiaries, to encourage job creation, business formalization, improved productivity and capacity enhancement of the operators. “The scheme would move the micro enterprises from the earlier informal to formal create jobs, wealth and alleviate poverty in the society “Others are enhancing competition of these enterprises towards meeting national, regional and global standards as well as improving internally generated revenue to reduce dependence on oil revenue,” he said. He said that the agency would work in partnership with banks, office of the Federal Inland Revenue Service, business development service providers, state and local governments, insurance companies and the Corporate Affairs Commission. 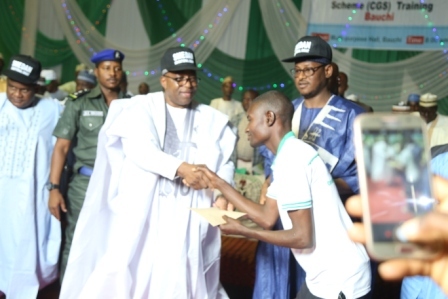 Special Guest of Honour at the launch and executive Governor of Bauchi state, Barrister Muhammed Abubakar in his remark said that the scheme would stimulate the generation of revenue in the state. He urged the beneficiaries to make judicious use of the funds to be granted to them towards industrial development of the state. He commended SMEDAN for this laudable initiative and reiterated his government’s commitment to support the Agency in the area of MSME development. Some beneficiaries commended SMEDAN for empowering them, Hajiya Karimatu Aliyu, thanked the federal government through SMEDAN for the gesture and promised to utilize the funds properly. While Aliyu Danbam noted that as an entrepreneur this was the first time he was benefitting from the government gesture. He promised to utilize the grant properly so that he can apply for more loans in future. Three groundnut oil and rice processing cooperative societies in the state benefitted from the scheme, with each receiving a cheque of N50,000. The groups are Gugulin Gaina Women Widows Processors Cooperative Society Ltd, Misau; Nasarawa Rice Farmers Cooperative Society, Azare and Fahimta Women and Youth Development Initiative, Kirfi. 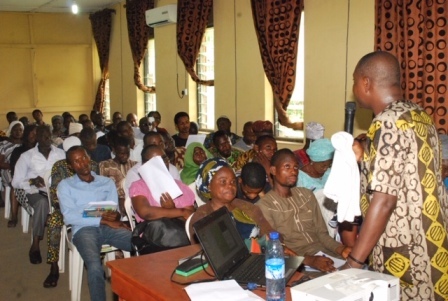 The event attracted traditional title holders and MSME stakeholders in the state.